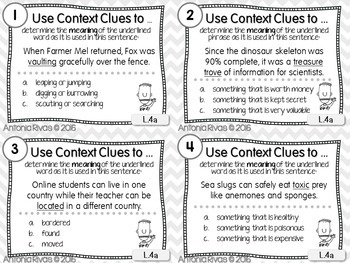 These CONTEXT CLUES Task Cards are a GREAT way to check student understanding on this important reading skill. 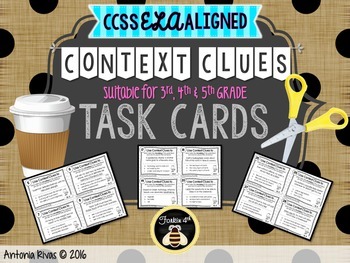 Task Cards are a fun way to engage students in standards-aligned activities. You may use these as a warm-up, exit slip, in small group, as a center, or SCOOT! These cards are printed 4 per page and are numbered and labelled for ease of use. Save on expensive toner with this grayscale set. 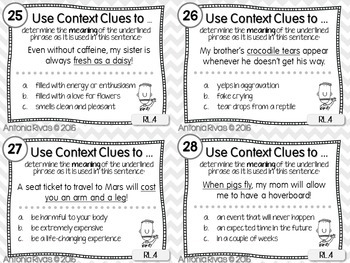 You'll also find a student recording sheet and a teacher answer key in this set! 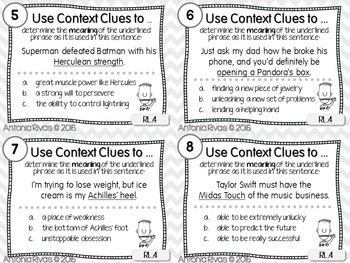 •Each card requires students to use context clues to determine the meaning of words, phrases alluding to Greek mythology, and/or figurative language (idioms, similes and metaphors). You MAY ALSO LIKE my EDITING TASK CARD set! RL.4 - Determine the meaning of words and phrases as they are used in a text, including those that allude to significant characters found in mythology (e.g., Herculean). RI.4 - Determine the meaning of general academic and domain-specific words or phrases in a text. L.4a - Determine or clarify the meaning of unknown and multiple-meaning words and phrases by using context (e.g., definitions, examples, or restatements in text) as a clue to the meaning of a word or phrase. L.4b - Use common, grade-appropriate Greek and Latin affixes and roots as clues to the meaning of a word. L.5 - Demonstrate understanding of figurative language, word relationships, and nuances in word meanings. Materials are licensed for personal use in one classroom only. For use in multiple classrooms, please help support my work by purchasing additional licenses.